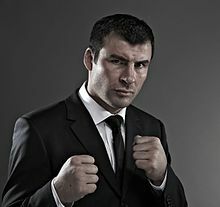 Joe Calzaghe MBE (born 23 March 1972 in Hammersmith, London, England), also known as "The Pride of Wales", is a Welsh boxer of Italian and Welsh descent, currently living in Cwmbran, Wales. I know that if I am not at my best and I do not perform I will lose. I'm never over-confident. Over-confidence is a weakness because it stops you training as hard as you should. It has happened to fighters like Naseem Hamed and Lennox Lewis. Complacency beats fighters. Calzaghe before his fight against Mikkel Kessler of Denmark. This page was last edited on 27 February 2019, at 22:32.